READ MY LIPS: Look, Up In The Sky! I admit I love a good superhero flick, but I didn’t realize how much until 2002. When I fell in love with Superman in the late 70s, I just attributed it to Christopher Reeves’ crystal blue eyes. In the 80s, when I passionately shot out of bed on Saturday mornings to watch Super Friends, I figured I was just like any other kid. However, even adults couldn’t resist the Bill Bixby-Lou Ferrigno super duo which was the Incredible Hulk. When my doctor asked me what I wanted to be when I grew up I said, “A doctor like you or Lynda Carter.” He thought I wanted to be an actress. 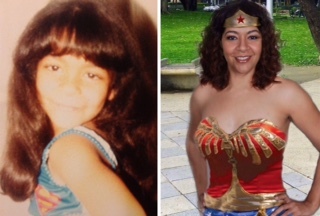 No, I really wanted to be Wonder Woman. After all, I was already wearing Supergirl Underoos. It just seemed like the next logical step. I don’t know what happened in the 90s. Maybe I was spending time on other pursuits or maybe this was a period that separated the true superhero aficionado from those on the mainstream bandwagon. Whatever the case may be, it wasn’t until the new millennium that I realized I must have a “thing” for superheroes. It happened while walking out of the theater after watching Tobey Maguire in Spider-Man. I was transported back to the days when I rushed home from school to watch Spidey on my grandparents’ television set. I even favorably reminisced over the short-lived live action series, The Amazing Spider-Man. All of a sudden, I had a desire to swing from flag poles and shoot web from my wrists. I found myself saying, “That was a fun movie.” A fun movie? “Who calls a movie fun,” I questioned? There must be something deeper underlying this excitement because by the time Iron Man was released I paid to see it FOUR times in the theater! And before I started writing this article, I unintentionally watched it on DVD THREE nights in a row. Who does that? Hmm, maybe it’s time for a quest. While watching or reading these stories, can we really relate to these superhuman characters? Or do we like the idea that someone so powerfully invincible or immortal could exist to save us from the peril of our mundane lives? What is it about the hero’s journey that resonates with so many people cross-culturally? I believe to answer that question we have to continue our search and travel across the space-time continuum. The story of the hero is neither new nor exclusive to humanity. Case in point, look at figures such as Thor and Hercules. They are a perfect bridge between modern American superheroes and the classical heroes of Norse, Roman and Greek mythology. When we examine mythological heroes like these, we begin tapping into the realm of the divine. They were either demigods themselves or mortals who had a close, but often conflicted relationship with the gods. Many times they struggled between their loyalty to the things of earth and that of the heavens by acting as a liaison or protector of humans. Themes such as worship and glory are often associated with these types of heroes, which bring me to Act III of this article. Like all good stories, you can see the end from the beginning and see the beginning in the end; it is cyclical. The Nativity Story of Jesus Christ prophesies his journey as the World’s Greatest Hero. Act I: He departs from the glory on high to become a babe wrapped in swaddling clothes, lying in a manager. Act II: He travels the fields at night and in the city by day to respond to and be tried by all who are sore afraid. Act III: He returns to the Glory of God in the highest having accomplished His mission to bring peace on earth and goodwill towards men. However, what sets Him apart from all other superheroes is that He is willing and able to share His power and glory with all who would believe in Him. I don’t know about you, but that’s an identity I would love to assume. That’s the Saving armor I would like to wear— complete with a belt of Truth, the x-ray vision of Faith, shoes so full of the Good News they can climb up the side of buildings, the smashing strength of Righteousness and last but not least the slinging hammer of the Word of God. And if that’s not enough, this story never ends. We get to share Eternal Life with the Master of the Universe and never suffer again, if only we believe. Sounds like a thrilling adventure to me. How about it? Let’s believe. Look, up in the sky!!! That was a truly amazing article. I too love the superhero. But the Savior of the world is truly the best superhero of them all. This is one of the best stories I’ve read in awhile. Really gets you thinking about Act III of your own story. Just how will your story end? You guessed it! Thanks for reading and commenting JosieD! This is so close to home for me for I have been in love with Superheroes since preschool years. Being a teacher & assisting children to develop & learn through their great imaginations I’m giving them the abilities to see the Heroes within. This article proves how Christ lives within me giving me the power, strength, & unknown ability to help others see their great potential in life! I can’t wait to read more for Act 1 through Act 3 we can all resonate with in our journey looking up to the sky! Thank you so much, Marsol!!!! I love how you applied the message to your students and your spirituality. You are a Wonder Woman!!! I got a rock. Maybe I’ll build something on it. Good thinking, Paul! You are a model for all the Charlie Brown’s of the world. If you get a rock, do something with it! Good story, I like the part about Jesus and super heroes. Thank you, Bobby! Jesus is THEE Superhero! Master of the Universe! Well said! We all loved the supernatural growing up. But experiencing the supernatural life with Holy Spirit is better than we could have ever imagined as kids growing up! Well said Jaye, awesome article! Thank you so much, Sjana! It is such a blessing to have Real Power in our lives as adults and the ability to impart it upon our own children. Thank you for sharing your perspective. Even in the world, there is always someone greater, someone else who can hold power over us. Why not accept the One Who is most powerful and yet shares it with us? No other power shares! It only rules, but Christ, though He alone rules, shares His power with us. Wow! That’s epic! Reading your comment gave me chills. It is so true that even in the world we are told “there’s always someone better.” Why not accept the One who is Better AND shares!? We are joint-heirs with Christ! Thank you so much, Janie for seeing how epic this really is! Interestingly enough i was up late last night watching The Incredibles. Andi, what a wonderful parallel! Thank you so much for sharing. HE is the ultimate superhero who invites us to join Him and makes it very possible for us to have success with Him! Yeesss!! Thank you Fatima for “getting it”… for understanding and for the success! This article is fantastic! I love that even though you highlight some of our favorite superheroes of all time, ultimately you glorify The Superhero of all superheroes, Jesus! You encourage us, the readers, to keep our eyes focused on The Real Hero. It personally reminded me that because Christ lives in me, then I share His super strength and powers as well. I can do all things through Christ Who strengthens me!